I did buy something(s) other than chocolate in Belgium! Well, minus that top in the middle, no it's not chocolate, but it's Primark number from good old Nottingham. I had a bit of spending dough (well.. Euro) so I felt like buying some blogable Belgian things and these two tops seemed just that. Starting with Brandy Melville... my god... that shop was good! I'd describe the brand as a merging of Urban Outfitters and Topshop, with a dollop of Ark and hippyness in there too. The prices in Belgium were similar to Urban Outfitter prices - this was about €20 (£17). I was reasonably happy to pay that - it was my birthday! Although I fear that the one London store will probably be a tad pricier. The top I've linked to is on the US site and isn't the exact one that I bought, mine is a longer vest top with drop arm holes, but it's the same print. As for Pull and Bear, I've visited the store in Stratford a couple of times, but I felt like the Belgian store was more 'my style'. But actually, saying that I haven't been to Pull and Bear in London for months now! I loved a ton of stuff in the Brussels store but decided to be a good Robyn and just get one thing. It's on the UK website at £9.99 - bargain! I did pay a little more in Euros surprisingly, but only another quid or so. Finally, my Primark top that I couldn't leave out. I've actually got a second one of these too - a grey version - but I was wearing it when I took these photos (and in my last outfit post in fact ;) ). They are ridiculously versatile, a definite must have for spring. I can definitely see these flying off those Primark rails dang quick as they're only £3.50 each and there are white, red and blue shades too. Hooray to my fellow students who've made it to Easter break! I'm working my (fluffy purple bed) socks off doing my dissertation still, but have got plenty of posts planned! By the way, the hilarious and foremost snazzy-stylin' Tasha from So On Trend has made me her Monday-Must-Read today! How super-kind is that? She's on my blogroll (ie. one of my absolute faves) so you seriously need to check her out in her cha-mazing garbs. 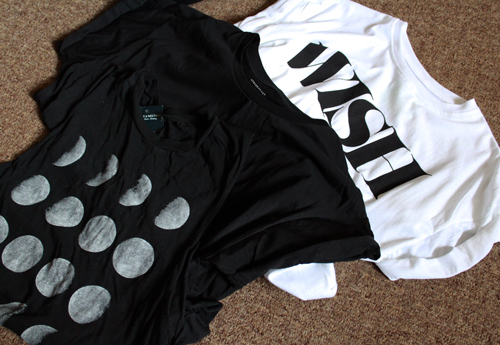 Love the wish t shirt! Glad Brussels was so much fun, love the pull and bear top. Enjoy your time off for easter! I've never shopped in Pull & Bear before but that tee is cuuute! I don't think I'd be able to buy anything BUT chocolate in Belgium! Weird you say that about pull and bear! I felt the same about the london store and have found much nicer stuff in other places! I have that brandy top! I love it! great buy! Also congrats on making it to Easter break! I am a little in love with the Brandy vest. It's super versatile as well, can be dressed up easily! LOVE!